"The ease of stirring creates solace of the mind." "I have always enjoyed baking and cooking. I love to see the pleasure and excitement of people enjoying the food that I've made. My cakes are all made from scratch with the freshest ingredients. I know you will be happy with the custom look of your wedding or occasion cake and you will love the great taste! I want to thank you for ordering, Delectable Cakes By Lisa." Familial tradition is what first led Lisa to the art of creation in the kitchen. Looking over the shoulders of relatives as a wide eyed youth, Lisa not only familiarized herself with the intricacies of carefully measuring ingredients but perfected the tender art of inserting a touch of love to a recipe. To Lisa, a personalized cake most often coincides with a life changing event for the recipient, with that in mind, taste and high quality ingredients take precedence in every sweet that passes through her kitchen. Cakes by Lisa sold their first cake in 1991, a pink on white two-tiered wedding cake with fresh flowers on top for an intimate garden wedding. 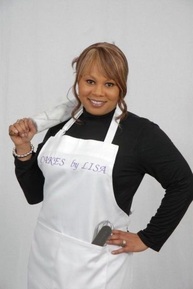 After receiving a confidence boost from the numerous thanks and accolades bestowed upon her, Lisa solidified her business in the Columbia, South Carolina area and now bakes and assembles moist and personally baked varieties throughout the region. Lisa most recently introduced her signature confection, "Delect a' bars," and now takes advance orders to keep up with supply. These bite sized three layered treats, created with a moist cookie bottom, a thin layer of pure chocolate and topped with rich cheesecake and can only be described in one word - delectable. Lisa not only bakes mouth watering flavors such as; blueberry pound cake, red velvet, carrot and chocolate cake, she creates awe inspiring art with food.